Directions(1-6): Study the following information carefully and answer the given questions. Seven footballers namely, Messi, Alexis, Neymar, Ronaldo, Benzema, Higuain and Bale have come into the ceremony of 'Ballon d'or'. They are sitting in a row facing north but not necessarily in the same order. Each one of them has different types of cars, i.e, Audi, Mercedez, Chevrolet, Ferrari, Wolveswagon, Toyota and Fiat, but not necessarily in the same order. >> The person who has Toyota, sits fourth to the right of Alexis. >> Either Alexis or the person who has Toyota sits at the extreme end of the row. >> Only one person can sit between Bale and Alexis. >> Ronaldo sits third to the left of the person who has Audi. >> Bale is not immediate neighbour of Ronaldo. >> Only one person can sit between the person who has Mercedez and Benzema. >> Neymar and Messi are immediate neighbours of each other. >> Messi doesn't have Toyota. >> The person who has Fiat, sits third to the left of the person who has Wolveswagon. 2.How many persons are there to the left of Messi? 3.Who is sitting second to the right of the one who has Fiat? 4.Who is sitting at the middle of the row? Directions(7-8): Study the following information carefully and answer the given questions. Brijesh starts walking from his home and walks 12km towards north. Then he turns to his right and walks 20km. Then he turns to his left and walks 8km. Finally he turns to his right and walks 20km and reaches at Point Y. 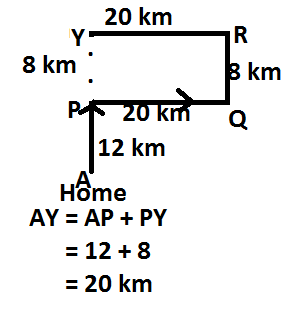 7.Towards which direction does Brijesh move before reaching at point Y? Directions(9-10): Study the follwing information carefully and answer the given questions. Malay drives his car 25 km towards south from his home. Then he turns left and drives 45 km. After that he turns his left and drives 25 km. Finally he turns right and drives 20 km and reaches his office. 9.Malay's office is in which direction from his home?